Tyrannosaurus is a bully. He is cruel and selfish. Everybody runs away from him because they are terrified. But it happens one day that Tyrannosaurus falls from the cliff, and Elasmosaurus helps him out of the water just when Tyrannosaurus is about to drown. Elasmosaurus lives in the water, so he doesn't know how mean Tyrannosaurus usually is. He not only saves him, but he also heals his wounds and brings him food. They become friends, and deeply enjoy spending time together. Tyrannosaurus feels like a new dinosaur. He smiles, eats berries, and looks happy and relaxed. One day Elasmosaurus is attacked by a nasty dinosaur from the sea. Tyrannosaurus finds him with his body all covered by bite marks. "What a terrible thing to do!" he thinks. He feels terrible. Only now he confesses to his friend that he is the cruel dinosaur everybody hates. 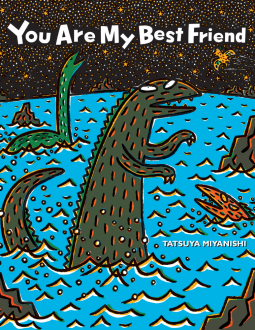 But Elasmosaurus knows that the true Tyrannosaurus is kind, and a great friend too. Once again, as in You look yummy! Tatsuya Miyanishi proposes a different way too see a situation. In this case he puts forward the idea of how caring about the bully is also a way to stop bullying. Because of his barbarous behavior, all Tyrannosaurus obviously gets from other dinosaurs is fear and apprehension. And although he seems totally fine with it, he only is truly happy when he finds a friend who loves him. I can perfectly envision this book as a trigger to wonderful conversations with my kids. The writing is different from what we are used to, but this probably has a lot to do with the translation from Japanese. The illustrations are also distinctive, but I like them very much. I'm already looking forward to future titles in this series.